I've been going to Jerez for the past 3 years and, even though I've tried all the different types of sherry wine, there's so much variety in terms of bodegas that I feel I know nothing about the matter. I'm not very fond of the dry wines like fino, manzanilla and even some amontillados. I like all the others and I particularly enjoy Pedro Ximénez despite its over the top sweetness. Until now whenever I asked for a glass of wine in a tabanco or restaurant I never asked from which bodega it came from. Next week I'm going to Jerez again and I'm changing that in order to better identify my preferences. Any recomendations for bodegas and specific wines you are particularly fond of? Bodegas Tradicion Smallish bodega with a nice art gallery (as far as I remember their wines are so so. Nice visit. I have fancied sherry as an aperitif before dinner since I began my US Foreign Service career many decades ago. Like many things, sherry is a matter of individual taste, but my favorite has always been a medium dry amontillado. It has a wonderful taste and puts an edge on the appetite. And sherry must be drunk from a real Spanish copita made especially for sherry. I bought myself a set of six copitas many years ago. In the US, even in the finest restaurants, if you order sherry it is often served in an Old Fashion glass. Ugh. Thanks Ed and Rob, I will try out those brands. I'm not interested in visiting the bodegas though, just curious about the personal preferences of Foro members regarding brands and types of sherries. Bill, drinking from the proper copita sure makes a difference. The little sherry I have home I always drink from a Porto glass, it's the closest I have to a copita. I'll remember to buy a small set of copitas this time. 'm not very fond of the dry wines like fino, manzanilla and even some amontillados. My mum was very British, and to her sherry meant Harvey’s Bristol Cream. Many people seem to like urium bodega and some of the unfiltered wines are good, called "en rama". Also try palo cortado. For example the Lustau palo cortado almacenista is quite good. I would like to ask you as portugese, what are the good portugese white wines that are slightly bubbly and served cold? I got to try some but it was just vino de casa from a restaurant, with no brand. In USA La Gitana was a favorite but comes in a personal Féria bottle, so over priced, and is often old. No good for sherry. I’m lucky to have a local store that keeps stocked up on barbadillo.... huge bodega that we had many memorable concerts and parties with Gerardo Nuñez. My father in law cooks with their amontillado. For me oloroso and amontillado = the flamenco negra. Fino and manzanilla = dry blanca. Perfect with jamon iberico and good cante. Oh, let me explain the bubbles. . Wife likes Cava...I don’t. We only have one champagne fluke left, so she used my copita. Lustau and Sánchez Romate are my go_to options. Palo cortado is my favourite type, but pricey. Amontillado is a good place to start, or oloroso. If you find them too dry go for 'medium' which has a dash of pedro ximenez to sweeten. The town of El Puerto de Santa Maria was the largest exporter of sherry for a long time. The size of the bull ring lays testament to that - sadly. Well worth a visit Fred and just 12 mins by train from Jerez. On a Friday or Saturday, when we leave the market we head down towards the river. On the way a little bar offers a copita and, the last time, a slice of Iberico sausage on a slice of very fresh bread. Sometimes ham or lomo. I like Manzanilla if it is very cold, and the other end of the scale (see what I did there ) in winter. The ones in the middle, especially oloroso, are not to my taste. If I wanted to try the different Bodegas (there are still 9 in Puerto) I'd go to the supermarket and buy a bottle of each. It's rare a bar would offer much of a range having to already offer 7 to 9 types. 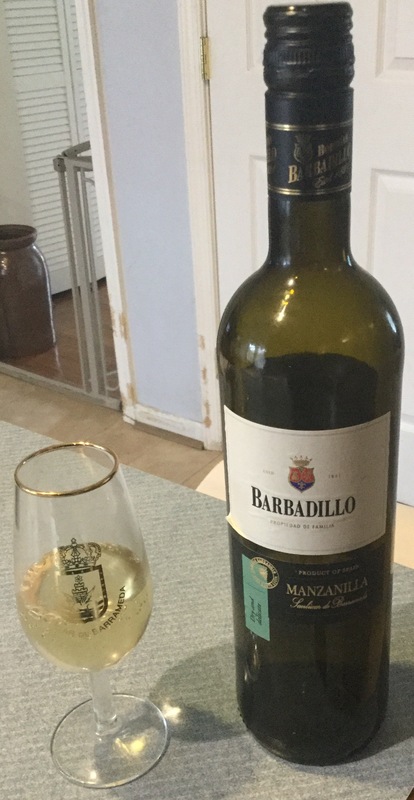 The Barbadillo is what you often get if you ask for dry white here, in its simple wine form. Sadly the sherry market is half what it was and that is said to be largely down to the Brits turning elsewhere. Had many discussion how it could be relaunched to a younger market but sadly never heard or come up with a good solution. Tomorrow I'm off to the Carnaval in Cadiz and sure to down a few. Even today we had bottles of Carnaval Estrella de Galiicia (same lovelly Estrella but a carnaval themed label on the bottle). Then Sunday the foro get together in Jerez. And Monday a flamenco lesson. Could be an alcoholic few days. In the late '70s-early '90s I worked a fair amount for the UK Atomic Weapons Research Establishment, a large industrial complex out in the country at Aldermaston, not far from Reading, 30 or 40 miles west of London. Though I objected to having lunch separate from other members of my party, I was socially obliged to eat at the Director's Mess with British colleagues: white tablecloths, china, silver flatware. I much prefer fino or manzanilla, but I was also socially obliged to knock back a lukewarm dose of Harvey's Bristol Cream while making small talk before sitting down to eat. When Larisa and I first went to Jerez together more than 12 years ago, we stayed at a hotel across the street from the Sandeman bodega. The whole neighborhood was bathed in a soft warm aroma. Sadly, the financial crisis seems to have taken out the hotel. Sandeman soldiers on. White wine isn't my specialty really. However, from the little I know, one that stands out for me is the Alvarinho. It's from a specific variety of grapes from the north of Portugal and when I traveled on those places some years ago I tried a few and all were great. Fred it is also grown in Galicia (NW Spain) and around Leon, and can be had in most restaurants and supermarkets all over Spain. It is alboriño in Spanish for anyone who wants to try it. According to a very old friend of mine in Madrid in the 80s he remembered it arriving in Madrid in unlabelled bottles, and it disappeared quickly. He took me once to a large fish market in Madrid. You bought whatever fish and marisco you fancied at large market stalls. Then went to the restaurant and handed your goodies to the waiter. The chef then went to work. Sadly no longer exists. I remember once having a large white fish in salt. They gave you a hammer to crack the salt casing open. We always had a bottle or two of Alboriño. Happy days. It is one of my favourite wines and has become my standard birthday and christmas present from my Spanish family. Maybe I'll get to share a bottle with you Fred? I'm going to Jerez tomorrow with two friends of mine. We'll get there at about 8 PM and we're going to the Tia Juana del Pipa concert at 11 PM. If you're still around before or after the show I'll be happy to have a few drinks with you! We'll stay in Jerez until Sunday. Nigel, I wonder if you're going to the 11pm concert of diego and tia tomorrow? I dropped you a private message with my phone number, please give me a call or write on whatsapp. I would like to share a ride back to el puerto if you're going. I am also interested in seeing Wilo del Puerto in the La Guarida on thursday at 23.00. Fred I have a guitar lesson in Jerez 10:30 am to 12 noon on Friday. After that I aim to find a bar and have some alboriño and some tapas, and then find some local bar flamenco. If you fancy it at the moment I'll head to El Almacen in C/ Latoorre (ETA 12:40), but open to suggestions. Tele sad to say due to family commitments I can't do any late evenings this year. It's a pity as I would have happily shared a ride back. But maybe we could share a sherry some time in El Puerto. And of course if you're around Jerez Friday lunch time. Sure Nigel you can write your phone number by PM to me and we can see about meeting. Any idea how much taxi would cost from jerez to el puerto at night time? Nigel, I'll be with friends and we might not be in Jerez during the daytime. I'll let you know on Thursday if we are in town.